B Street tells intimate stories about the street of shops, restaurants, bars, and brothels where the workmen who built the Grand Coulee Dam spent their recreational hours and wages. From the beginning, B Street was the place to play and let off steam for the white workingmen who had faced the hard times of the Depression. It was a raucous playground that denied blacks and most dark-skinned Indians… access to the frivolity, good times, and pretty ladies that were the main attractions of that provocative place.This vivid story of a colorful era is based largely on the memories of Lawney L. Reyes. As a young boy he wandered B Street with his little sister, Luana, and their dog, Pickles, while their Indian mother and Filipino father eked out a living running a Chinese restaurant. His mother's diary and the stories told by his parents and older members of the Sin-Aikst tribe contribute to his story.Reyes tells of hard times, dreams, and extreme courage and reveals the humor, toughness, and recklessness of the adventurers who came to work on the dam. 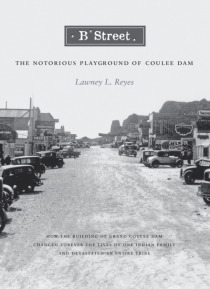 He also describes the history and culture of the Indians whose villages were flooded and whose way of life was irrevocably changed by the building of the Grand Coulee Dam.